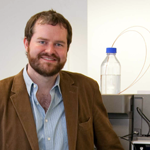 Assistant Professor Matthew F. Bush has been selected to receive the 2014 Eli Lilly and Company Young Investigator Award in Analytical Chemistry. The award is given by the Analytical Chemistry Academic Contacts Committee at Eli Lilly and Company based upon Dr. Bush’s outstanding research, publication record, and the impact they feel he is making in the field of analytical chemistry. Eli Lilly awards these grants in many fields of chemistry and the life sciences to new, outstanding faculty members at universities throughout the country with the aim to strengthen ties with the academic community and, at the same time, provide support for leading scientists in analytical chemistry. For more information about Professor Bush and his research, please visit his faculty page and research group website.